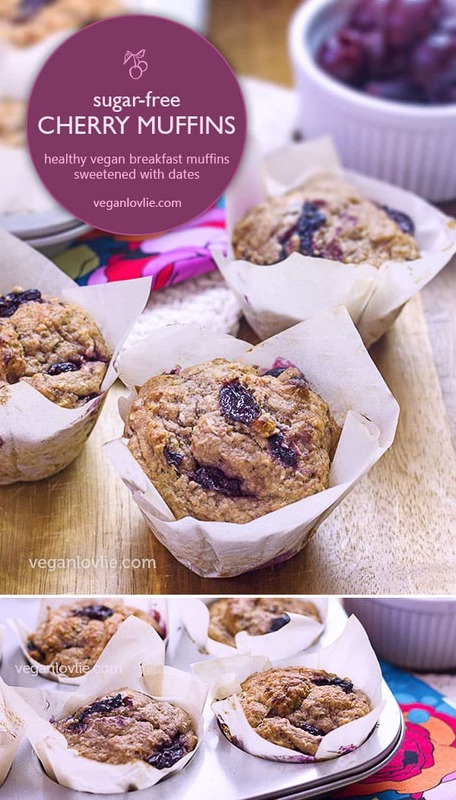 Moist wholesome sugar free muffins that are not your usual butter/sugar filled muffin, yet they taste delicious! 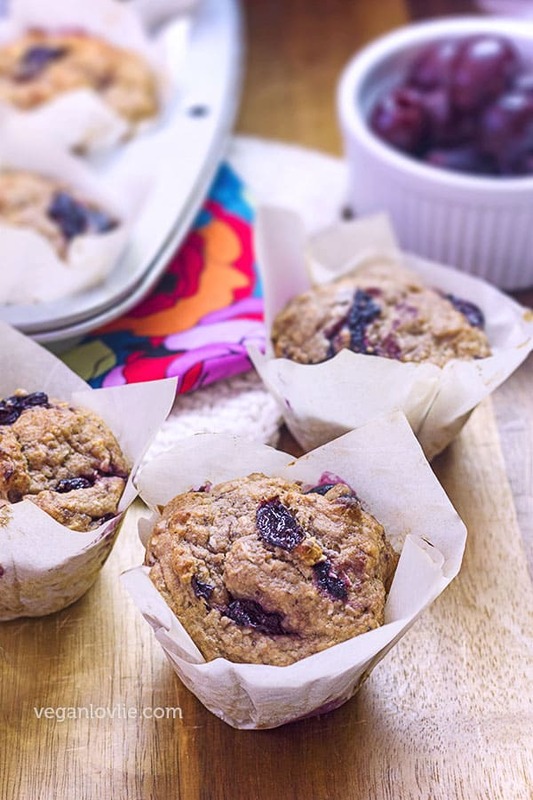 These Cherry Muffins are naturally sweetened with pureed dates and loaded with cherries for some nutritious healthy sweetness. The fruits also provide an extra helping of dietary fibre. 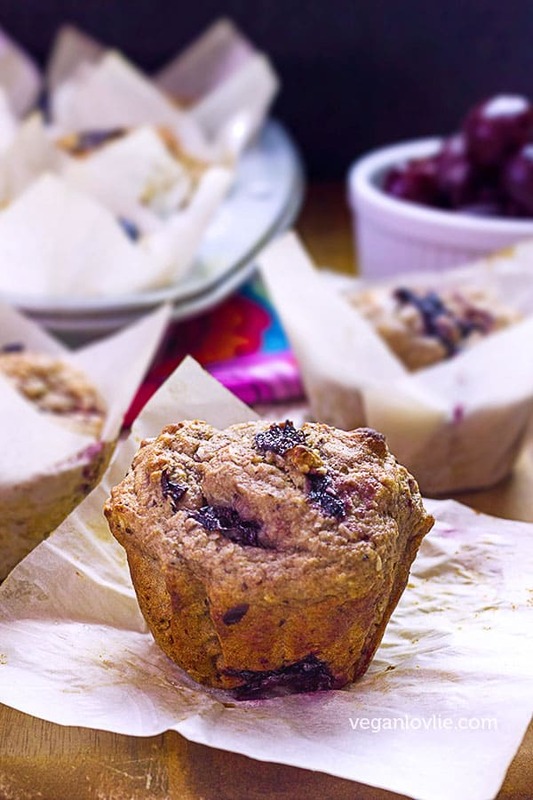 These breakfast muffins are a healthier addition to any morning sweet treat or snack. Whole spelt flour makes them very filling; just one of these muffins keeps you satiated for at least a couple of hours. Savoury breakfasts are what Kevin and I tend to lean more towards. Vegetable pancakes, crepes with chutney or savoury bread pudding are a few recipes among others, that I make quite regularly for breakfast. If you follow us on Instagram, you might have had a glimpse of our breakfast/brunch meals like breakfast sandwiches, our veggie English breakfast, veggie patties in wraps, or these delicious chickpea omelettes. Most of our breakfasts tend to be more like brunches! Sometimes I like to serve a sweet breakfast treat that goes so well with a nice cup of tea to start the day. I do occasionally make the more indulgent kind of muffins for dessert or to go with my afternoon tea as, it’s not just me but Kevin also loves these sweet treats. So, while I enjoy bringing us both the delight over the occasional sweet bite for breakfast, I also want to make sure it’s a healthy meal to start the day. 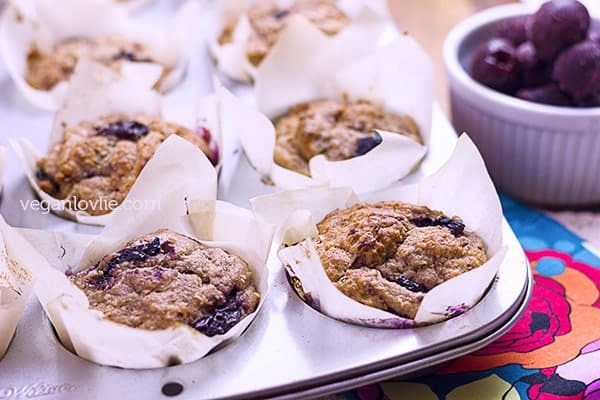 These cherry muffins fit the bill just right and attunes both sides. They contain no added sugar but still taste sweet and make a much healthier breakfast option. Pureed soaked dates and a generous handful of fresh or frozen sweet cherries imparts just the right amount of sweetness to satisfy the taste buds while not adding empty calories as refined sugar would. Dates have a caramel-like flavour which when mixed with the cherries in this recipe, add a deep intricate richness to these muffins. Fruits also contain a lot of dietary fibre that make them very filling. These muffins have the perfect sweetness without being overly sweet although they are a tad less sweet than your regular muffin. If you have a palate for slightly sweeter treats, add 1 – 2 tablespoons of maple syrup to the batter and then reduce the coconut milk by the same amount to keep the total amount of liquids as per the recipe. Coconut oil is a healthier option than margarine. 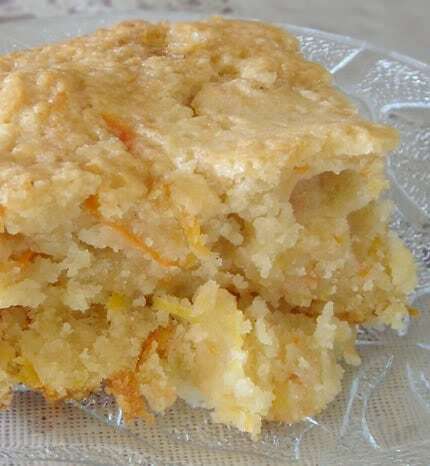 You may reduce the oil (by 2 tablespoons) and substitute with the same amount of some apple sauce but I do like to keep a little oil in baked goods for the texture, taste and moisture. As for the flour, whole spelt flour makes wholesome muffins and provides some extra dietary fibre. 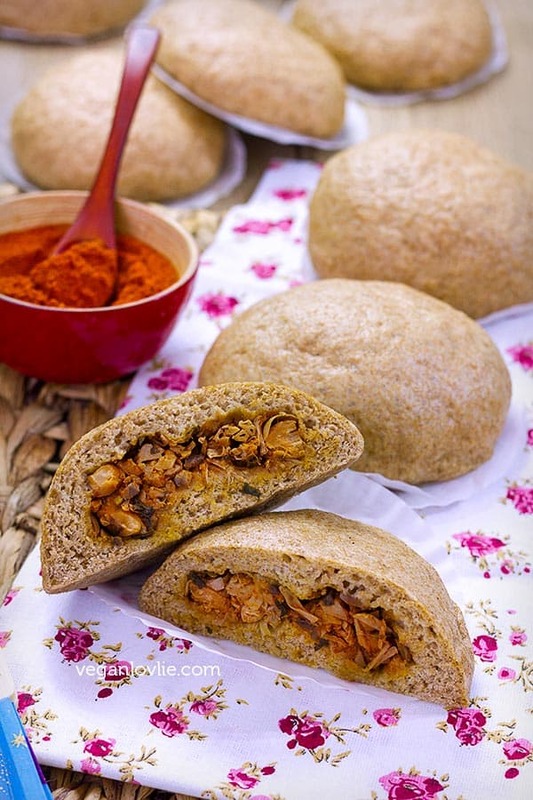 You may substitute with whole wheat flour if you can’t find spelt flour. I would think a gluten-free flour blend or oat flour + some starch will also work. The batter for these muffins is not runny. It is in fact more like cookie dough. Don’t be tempted to add more liquid to it (see recipe notes for whole wheat flour) or you’ll end up with a rubbery texture! When baked, the dates and cherries release their moisture and make these muffins fluffy and soft. Place the dates in a bowl and cover with 100 ml warm water. Leave them to soak for about 20 – 30 minutes. Line a muffin tray with some baking cups or cupcake liners and set aside. 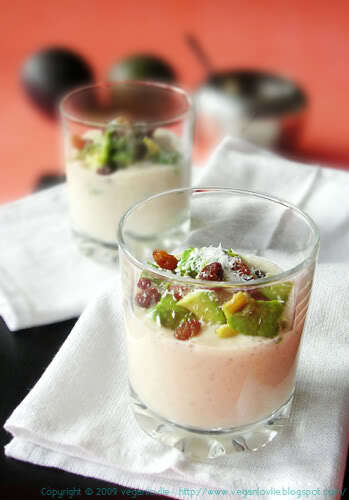 Place the softened dates along with the water that they have been soaking in in a blender. Add the rest of the wet ingredients except the oil (i.e. coconut milk, vanilla extract, almond essence and rice vinegar). In a mixing bowl, mix all the dry ingredients together. Make a hole in the centre and pour in the wet ingredients from the blender. Add the oil. Stir it with the wet ingredients. Then start to mix the wet ingredients with the dry. When the mixture is half wet, add the cherries. Continue to mix until everything is well combined. But do not over mix the batter. Immediately fill each cup of the tray with the batter almost up to the brim. Bake for the first 15 minutes at 200C/400C then lower the heat to 180C/350F and continue baking for another 15 minutes. These muffins will keep for 1 day in an airtight container on the counter. If you want to keep them for longer (2 – 4 days), place the container in the refrigerator as the fruits may cause the muffins to go off more quickly if left on the counter. I like to just reheat them for a few minutes in the oven before serving. Enjoy! Moist wholesome sugar free muffins that are not your usual butter/sugar filled muffin. 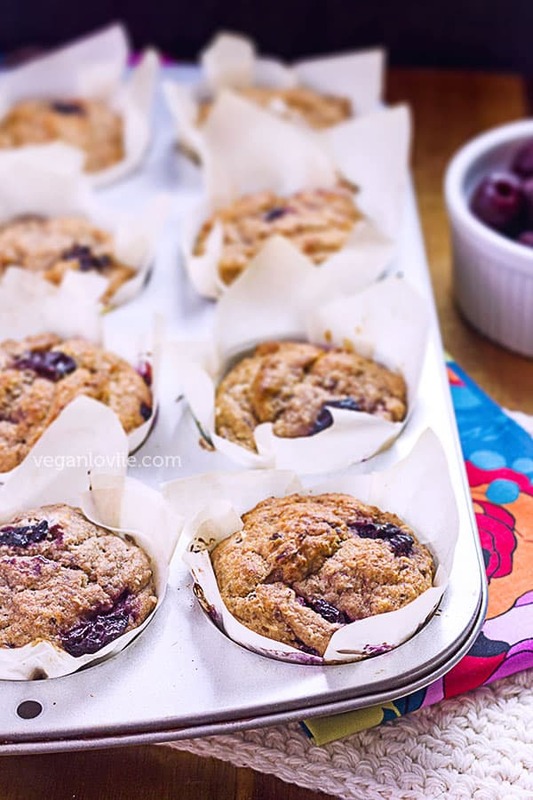 These Cherry Muffins are naturally sweetened with pureed dates and loaded with cherries for some nutritious healthy sweetness. Place the dates in a bowl and cover with 100 ml warm water. Leave them to soak for about 20 - 30 minutes. These muffins will keep for 1 day in an airtight container on the counter. If you want to keep them for longer (2 - 4 days), place the container in the refrigerator as the fruits may cause the muffins to go off more quickly if left on the counter. I like to just reheat them for a few minutes in the oven before serving. Enjoy! VeganMoFo 05: I like my avocado sweet!